This is how the Afsluitdijk looks today; the former Zuiderzee is to the right, the Waddenzee to the left. The Nobel laureate H.A. Lorentz is not normally associated with the type of science that needs heavy numerical work to arrive at an answer. And yet, it was Lorentz who pioneered the numerical approach in hydraulic engineering. In the years 1918-1926 Lorentz consulted for the Dutch government in the Zuiderzee project. This project consisted in the transformation of an open sea (the Zuiderzee) into a closed lake (to be called the IJsselmeer), by means of a 30 km long dike (the Afsluitdijk). 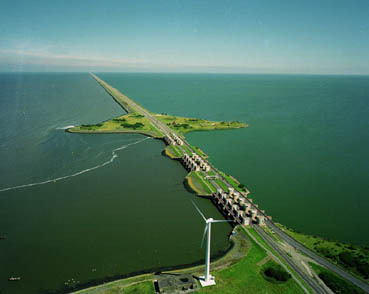 The Afsluitdijk would protect the Zuiderzee area from the flooding that occured regularly. (The catastrophic floods of 1916 had convinced the Dutch Parliament of its necessity.) But by closing off the Zuiderzee, the tidal movement in the Waddenzee, to the North of the Zuiderzee, would intensify and this might severly increase the risk of floods in that area. By how much would one have to raise the dikes along the Waddenzee once the Zuiderzee would no longer be able to absorb the high tide? Estimates ranged from 15 centimeters to 4 meters. A task force was appointed, headed by Lorentz, to investigate this problem. In all fairness I should confess that I was intimidated by it, because a physicist is not used to problems with this level of complexity and with so few solid facts. But then I thought that, even if I lacked the experience and intuition of an engineer, the other members of the State Committee would make up for that. This raised my hopes and in the end the work was more doable than I had expected. In fact, I can say that we have been able to get more out of it than we had anticipated. 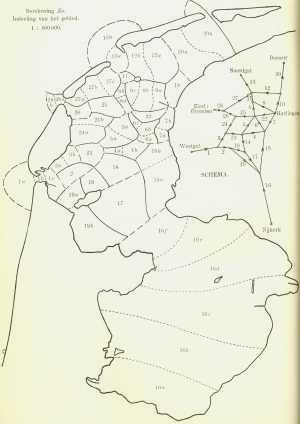 This figure, taken from the Committee's final report, shows the network of gullies in the Waddenzee used in the calculations of the tidal flow. Indeed, they had gotten much more out of it than anyone would have expected. Hydraulic engineering was mainly an empirical science at that time, but the disturbance of the tidal flow caused by the Afsluitdijk was so unprecedented that the empirical rules could not be trusted. Lorentz proposed to start from the basic hydrodynamic equations of motion and solve the problem numerically. This was feasible for a "human computer", because of the quasi-one-dimensional nature of the water flow in the Waddenzee. This is a very shallow body of water, containing a few deep gullies within which the flow of water is concentrated. The equations of motion need only be integrated along the network of gullies to obtain a reliable estimate of the tidal movement. A key simplification (now known as the "Lorentz linearization") was to replace the quadratic bottom friction by a tidally averaged linear one. The numerical calculations were so lengthy, that we came close to the ultimate limit of what can be done in this way. I myself had no part in this. I did try once or twice to set up and work out such a calculation, but then it would turn out that I had made a mistake, so that it had to be done all over again by others. The Afsluitdijk was completed in 1933 and the predictions of the Lorentz Committee turned out to be remarkably accurate. Lorentz himself did not live to see the success of his work. He died in 1928. One of the giant locks along the Afsluitdijk bears his name. More on the role of Hendrik Lorentz in Physics and Society.